Crowdsourced placemaking had been a private sector sponsored success in Bristol, CT, but what about coming from the public sector? – A municipality doesn’t do placemaking, or implementation, the private sector does. It’s the actual physical implementation of building real places that sets crowdsourced placemaking apart from just crowdsourcing. – The city government is obligated to listen to everyone, which means the ‘good’ will be countered with the ‘bad’ and the status quo will result..
– There’s just too much bureaucracy in government for them to sign off on something like crowdsourcing. – Sponsored by the city planning department, the staff understands that it’s the private sector that does the actual placemaking when it comes to buildings, but that the public sector sets the rules when it comes to public places, which are often critical to the success of buildings. In addition, ideas that reach a certain level of popularity that are private sector oriented, such as a coffeehouse or a mixed-use building, are then connected to a private sector entity that’s willing to work with the crowd, given the benefit of having a market already assembled for them. – The City of Hilo already went through an extensive visioning process to create a plan on how to essentially be more triple-bottom-line (economically, socially, environmentally) sustainable and prosperous by 2025. So it wasn’t difficult to require that all ideas be triple bottom line to comply with the plan. 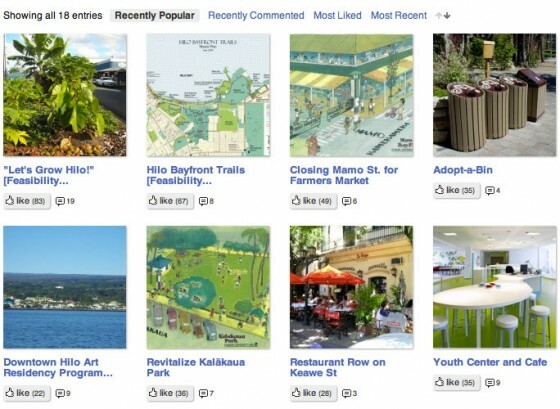 – Why did the City of Hilo actually make the leap ahead of everyone else in what may very well be the standard way we plan and develop places in the future? It takes one person willing to be a pioneer, willing to take a risk, in a position of enough authority to make it happen, and that person was city planner Susan Gagorik.